Heat the oven to 375 degrees. Grease a 10-inch by 8-inch or 12-inch by 9-inch baking dish or gratin pan. In a mixing bowl, mix together the fruit, 1/2 cup flour and the granulated sugar until the fruit is well coated. Transfer to the pan. Evenly spread the crème fraîche over the fruit mixture using a rubber spatula. In a mixing bowl, combine the brown sugar, salt, lemon zest and 1 cup flour and mix together. Add the vanilla and melted butter and mix until it becomes soft dough. Crumble the mixture with your fingers evenly over the fruit. Bake for 35-45 minutes or until the top is golden brown and completely cooked through. The dish can be prepared 8 hours ahead, covered and kept at room temperature before serving. Reheat in a 375 degree oven for 10 minutes before serving, or serve at room temperature. In the top of a medium-size double boiler, combine the egg yolks, sugar and Limoncello and whisk until well blended. Place the double boiler over medium heat and whisk the mixture vigorously until it becomes foamy and begins to thicken. Remove the mixture from the heat and let cool for 10 minutes. Add the cream and whisk until incorporated. The consistency should be thick and custard-like and should be able to coat a spoon. Place the berries into individual small serving bowls (wine goblets look pretty). 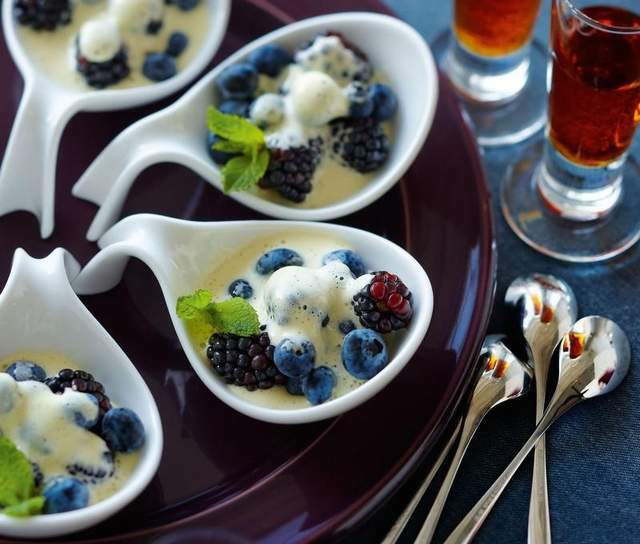 To serve, pour the zabaglione over the berries evenly, garnish with mint, and serve immediately. You can serve the zabaglione chilled and prepare it up to 6 hours ahead. Cover and refrigerate, and make sure to whisk it right before serving. If you enjoy this dessert, consider swapping out the Marsala for other liqueurs like Grand Marnier, Amaretto or Frangelico. I like to garnish the dessert with a flavor from the nut liqueurs, if possible, so toss on a few toasted almonds or hazelnuts, if you like. I usually serve a plate of almond or butter cookies to accompany. Makes about 1 ¼ cups; serves 6 people as a topping. Grease and flour a 9-inch lightweight Bundt pan. Preheat the oven to 350°F. Sift the flour, baking soda, and baking powder together in a medium mixing bowl. Set aside. In a medium bowl with an electric mixer on medium speed or in a food processor fitted with the metal blade, beat the butter and sugar together until light and fluffy, about 4 minutes. Beat in the eggs, zest and lemon extract and mix for 2 more minutes. Reduce the mixer to the lowest speed, add half the flour mixture, and mix until well combined. Add half the sour cream, mixing constantly, and then add the rest of the flour and sour cream, ending with the sour cream. Pour the mixture into the prepared Bundt pan and bake for about 35 to 40 minutes or until a cake tester inserted in the center comes out clean. Cool in the pan for 30 minutes, then invert onto a cake rack. Make the glaze: Using a wire strainer, sift the powdered sugar into a small nonaluminum bowl. Add the juice and lemon zest and whisk to break up any lumps. Place the cake and the rack on a wax paper-lined rimmed baking sheet. Using a long skewer, poke holes in the cake almost going through the bottom at 1-inch intervals. Slowly pour the glaze over the cake, making sure that it’s absorbed as you pour. Let the cake come to room temperature. This can be prepared up to 3 days ahead and kept at room temperature, tightly covered. The cake can also be tightly wrapped and frozen in aluminum foil up to 2 months. 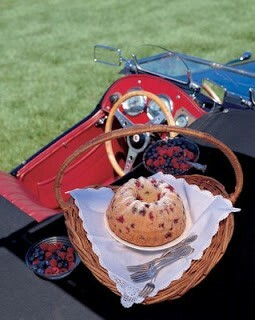 Check out Quick Bundt Cake Tips here. Preheat the oven to 300°F). Place six 3⁄4-cup (6–fl oz ramekins) in a shallow roasting pan. In a saucepan over medium-high heat, combine the cream and vanilla. Cook until small bubbles appear around the edges of the pan, about 5 minutes. Remove from the heat, cover, and let stand for about 15 minutes to infuse the cream with the vanilla. In a bowl, whisk the egg yolks with 1⁄3 cup of the sugar until pale yellow, 2–3 minutes. Slowly whisk the warm cream mixture into the egg yolk mixture. Pour the egg yolk–cream mixture through a fine-mesh sieve into the ramekins, dividing it evenly. Pour simmering water into the roasting pan to come one-third of the way up the sides of the ramekins. Cover the pan with aluminum foil. Bake until the custards are set but the centers jiggle slightly when the ramekins are gently shaken, about 40 minutes. Remove from the oven and let cool in the water bath, then lift out the ramekins. Cover and refrigerate for at least 4 hours or for up to overnight. Just before serving, remove the custards from the refrigerator and transfer to a baking sheet. Using a fine-mesh sieve, sift the remaining 1⁄3 cup sugar over the tops of the custards to form a thin, even layer. Using a kitchen torch, and holding it about 2–3 inches) from the surface, caramelize the sugar by constantly moving the flame over the top until the sugar bubbles, about 30 seconds. Alternatively, preheat the broiler (grill). Slide the baking sheet under the broiler 3 inches from the heat source and broil (grill), turning the ramekins to cook the sugar evenly, until the tops are caramelized, about 1 minute. Serve immediately. Combine the flour, salt, baking powder, baking soda and cocoa powder in a mixing bowl. Whisk the dry ingredients together. Reserve. Combine the eggs, vinegar, vanilla and buttermilk in a glass measuring cup and whisk together until blended. Reserve. Place the oil in large mixing bowl. With an electric mixer on medium-speed slowly add the sugar and beat until incorporated, about 1 minute. Add the food coloring and beat until bright red. Alternate half of the dry and wet ingredients on medium speed. Repeat with remaining ingredients ending with the wet ingredients, until the batter is completely mixed together and there are no lumps. Transfer the batter evenly into the cake pans. Place on a baking sheet and bake about 35 to 38 minutes or until a toothpick comes out clean from the middle of each cake. Remove and cool in the pans. When cool, carefully loosen the sides of the cake and invert onto cooling racks. 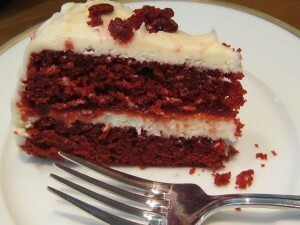 Make the frosting: Beat the butter and cream cheese together with an electric mixer on medium speed. Slowly add the vanilla and powdered sugar until incorporated; the mixture should be a thick frosting-like consistency. Place one cake layer upside down on a cake platter and spread frosting over the top and sides. Place the remaining cake right side up and frost the top and the sides until all of the cake is covered. Try to evenly cover the cake. Clean off any residual frosting on the platter. Serve immediately or refrigerate until serving. This can be made up to one day completely ahead and kept refrigerated. Remove from the refrigerator 20 minutes before serving. Makes a 2 layer 9 inch cake. Grease a 9 x 13-inch baking dish. Arrange the bread and the dates in the dish, making sure that they are evenly distributed. In the bowl of an electric mixer, beat the eggs and egg yolks on medium speed until they are frothy. Add the sugar and beat the mixture until thick and lemon colored, about 3 minutes. Add the half and half, reducing the speed to low, and mix to combine. Add the vanilla and nutmeg and mix to combine. Preheat the oven to 375F. Ladle the custard over the bread. Let the pudding sit for 30 minutes to 1 hour to help the bread absorb the custard, occasionally pushing the bread down with a wooden spoon. Place the pudding in the oven and bake for 20-25 minutes. Open the oven, using heavy oven mitts and with a large spoon, push the bread down. The remaining liquid custard will rise. Spoon the custard evenly over the bread slices. Bake for about 15-20 more minutes or until a skewer inserted into the center comes out clean. Remove the pudding from the oven, sprinkle it with powdered sugar and let rest about 10 minutes. 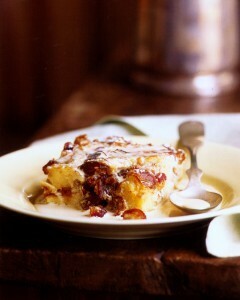 Spoon onto dessert plates and serve with creme fraiche or softened Dulce de Leche ice cream on the side. It is also excellent served cold the next day. Grease and flour a 9″ bundt pan. Preheat oven to 325F. In large mixing bowl, blend eggs and sugar with an electric mixer on medium speed. Add pieces of butter and Kirsch or fruit liqueur and blend with an electric mixer until fluffy. Add all but 2 tablespoons of the flour (reserving the 2 tablespoons to coat the berries), baking powder and salt and mix until well incorporated, with no lumps. In separate bowl, toss the berries with the remaining 2 tablespoons flour coating them evenly. Gently fold into cake mixture. Pour into prepared pan. Bake for 1 hour or until toothpick inserted in center comes out clean. Cool 30 minutes in the pan. Invert cake onto a cake rack and cool thoroughly. Dust with powdered sugar. Place on a platter and serve. This can be made a day ahead, covered well and left at room temperature.